HP has a long range of multi-function devices to serve for the growing Small Office Home Office environments. 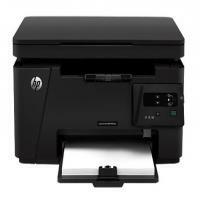 HP Laserjet Pro MFP M125A is another typical entry level printer that serves the same need. This is a lightweight compact printer which is small in size but large on functionality. It works well as a printer, scanner and copier. The HP Laserjet Pro MFP M125A delivers good and fast prints, with a resolution of 600x600 dpi and a print speed of 20 ppm. The 'Instant ON' technology not just helps to save electricity when idle, but it also helps in getting the first page printouts in quick time. While the toner supplied with HP Laserjet Pro MFP M125A yields up to 750 pages, the replacements can usually print up to 1500 pages. The print and scan results are of good quality though photocopying, especially that of greyscales, is average quality and could be better. One good thing as always about HP is the compatible toners available which greatly reduce operating costs, same is the case with HP Laserjet Pro MFP M125A Toner Cartridges. This device has one USB 2.0 port for connectivity and 128 MB of inbuilt memory. How to replace the toner cartridges from the HP Laserjet Pro MFP M125A printer? When a toner cartridge approaches the end of the useful life, you are prompted to order a replacement. You can continue printing with the current cartridge until redistributing the toner no longer yields to acceptable print quality. Follow the process below describing how to replace the HP Laserjet Pro MFP M125A toner cartridges to improve the print quality. Gently lift the scanner assembly. Open the top cover carefully to perform the replacement operation. Then remove your old dried out HP Laserjet Pro MFP M125A toner cartridges from the printer. Take out the new toner cartridge from the bag. Remove the orange protective tape from the cartridge before installing it. Place the used toner cartridge in the bag to send it for recycling. Grasp both the sides of the toner cartridge and distribute the toner by gently rocking the cartridge so that the toner evenly gets distributed. CAUTION: Do not touch the shutter or the surface of the roller. Align the HP Laserjet Pro MFP M125A toner cartridges with the tracks inside the product, and then insert the toner cartridge until it is firmly seated. Ensure that the replacement is properly completed and then close the top cover. Lower the scanner assembly and print a test page to check if the print quality is improved. Even after replacing the cartridges if the print quality is still not improved contact the Hp customer support to fix the issue. Q. Why it is necessary to clean the HP Laserjet Pro MFP M125A printer? A. During the printing process, paper, toner, and dust particles might get accumulate inside your printer. This can cause print quality problems, such as toner specks or smearing, and paper jams. To avoid such type of problems, you must clean the cartridge area and the printer media path regularly. Q. What is the resolution for scanning and copying function for HP Laserjet Pro MFP M125A printer? A. The resolution for scanning and copying function is 1200✕1200 dpi and 400✕600 dpi for scanning and copying function. Q. What is the inbuilt memory of this printer? A. The inbuilt memory of this printer is 128 MB. Q. Are the compatible HP Laserjet Pro MFP M125A toner cartridges effective enough to give high-quality prints? A. Yes, the prints taken from compatible toner cartridges are as impressive as the original toner cartridges. Q. Does the price of the compatible HP Laserjet Pro MFP M125A toner cartridges listed in your site include delivery charge? A. Yes, the price of an item do include delivery charge. The same price is applied to delivery. Q. For my printer, I’ve been using HP Laserjet Pro MFP M125A toner cartridges. But they cost me more and get empty soon. Do you offer any high-quality ink cartridge at an affordable range? A. The compatible toner cartridges at Printerinkcartridges.ie hold their ground next to the original HP Laserjet Pro MFP M125A toner cartridges. The prints taken from these compatible toner cartridges are good in quality. Also, the price of these toner cartridges are comparatively affordable than the original ones. Q. What connectivity does the printer supports? A. The printer offers USB 2.0 port for connectivity. Q. What is the use of ‘Instant ON’ technology? A. The ‘Instant ON’ technology helps to save electricity when idle and getting the first page printouts in quick time. Q. Can I use Apple AirPrint With HP Laserjet Pro MFP M125A? A. Sorry. The Apple AirPrint feature is not applicable with HP Laserjet Pro MFP M125A. Q. What are the benefits of HP Auto-on and Auto-off technology? A. The HP Auto-on and Auto-off technology conserves energy and reduces the clutter and waste. It allows the customers to stay more productive as the intelligence of this technology turns on the printer automatically when you want and turns off immediately when you don’t need it. This helps improve not just the personal resource consumption but also the environment. Q. Where can I recycle my HP Laserjet Pro MFP M125A toner cartridges? A. You can recycle original HP Laserjet Pro M125A toner cartridges with HP Planet Partner. But in case you want to recycle the compatible toner cartridges you can contact any authorised recycler near your location. Q. I want to adjust some settings for my HP Laserjet Pro MFP M125A printer via the computer. How can I do it? Please help. A. Sure. For Windows operating system use the HP Device Toolbox and for Macintosh operating system use the HP Utility. These will provide you direct access to the product’s HP Embedded Web Server from where you can adjust the settings, view your device and at the same time check the network status - this feature allows you to handle everything directly from your computer instead of the MFP control panel. Hope this answers your question. Q. Do you have the option for purchasing refilled HP Laserjet Pro MFP M125A toner cartridges? A. Thank you for the question. The list of compatible toner cartridges displayed above on this page are the recycled/refilled toner cartridges. These cartridges are cleaned, tested and refilled with first-grade toner to provide you printing quality as good as the original ones. Reuse of toner cartridge is the best form of recycling. Q. I have lost my network settings I want to reset my HP Laserjet Pro MFP M125A printer. Is it possible? A. If you are using an HP Laserjet Pro MFP M125A printer you can reset all your default settings. Restoring the factory settings will reset all of the printer and network settings to the defaults. It will not reset the page count, tray size, or language. To restore the printer to the factory-default settings, follow these steps. CAUTION: Restoring the factory-set defaults returns all of the settings to the factory defaults, and it also deletes any pages that are stored in the memory. From the printer control panel, press the Setup button. Select the Restore Defaults option, and then touch the OK button. Q. I am trying to print a webpage on my HP Laserjet Pro MFP M125A but the print quality is really dull. Is it the issue of HP Laserjet Pro MFP M125A toner cartridge or the PC? Try printing from a different software program. If the page prints correctly, the problem is with the software program from which you were printing and not with your printer. From the software or the web browser from where you are trying to print, select the Print option. From the Media: drop-down list, select the correct paper type. Click the OK button to close the Document Properties dialog box. In the Print dialog, click the OK button to print the job. On the printer’s control panel, press the Setup button. Use the arrow keys to select Print Supplies status page, and then press the OK button. If the HP Laserjet Pro MFP M125A toner cartridge is low on toner replace the cartridge. If it has enough toner proceed to the next step. Click the Start button, and then click the Programs item. Click your HP printer group, and then click the HP Device Toolbox item. On the Systems tab, click Service. The printer will print the first side and then would prompt you to take the page out from the output tray and reload it in Tray 1, keeping the same orientation. Wait until the process is complete. Remove the page that was printed. Try printing the web page again after printing the cleaning page, if print quality improves dont proceed further. Remove the toner cartridge from the HP printer, and verify that the sealing tape has been removed. Grasp both sides of the toner cartridge and distribute the toner by gently rocking the cartridge. Examine the surface of the imaging drum on the HP Laserjet Pro MFP M125A toner cartridge. CAUTION: Do not touch the roller (imaging drum) on the cartridge. Fingerprints on the imaging drum can cause print-quality problems. If you see any scratches, ƭngerprints, or other damage on the imaging drum, replace the toner cartridge. If the imaging drum appears fine, rock the toner cartridge gently several times and reinstall it. Print a few pages to see if these steps resolved the issue.